“Jackknife” is the term for a semi-truck trailer coming to an acute angle with the truck cab, like a small folding knife. 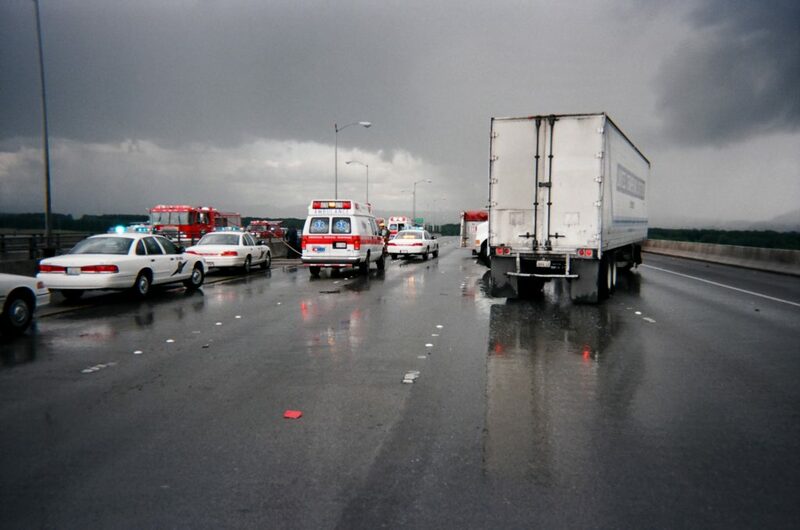 Over the past year, I have been looking the causes of semi-truck jackknifes on Washington highways, as Coluccio Law is currently working on a truck crash case in which fatal injuries were caused by a semi-truck jackknife. Semi-trucks are designed to carry huge loads on a frequent basis. These trucks and their trailers have a unique balance of weight and structure that makes them prone to instability. In a jackknife, either the tires on the cab lose traction, and the trailer pushes the cab into a fold; or, the trailer tires lose traction and the trailer swings around onto the cab. Jackknifing is caused by a number of reasons, all revolving around the way a truck is handled. Severe braking and skidding are the two most common scenarios. Curvy Roads. A semi-truck on a road that has a sharp curve is dangerous to be near. While the truck makes the turn, the trailer behind it has to be kept in sync or it can swing in the opposite direction, and fold inward. The weight of the truck vs. its size. Because of the unique structure of a semi-truck, it is generally true that heavier the load, the lesser the chance of it jackknifing. Consequently, when a semi-truck travels with less weight at a high speed, it jackknifes comparatively easily. Bad weather conditions. Hazardous weather conditions can make for a very dangerous drive, especially for a semi-truck. During heavy rain or snow, trucking companies usually force truck drivers to cover long distances despite decreased visibility and slippery roads. These situations are dangerous for the truck driver and everyone else on the road. Truck speed. A jackknife can be triggered when a trucker is traveling too fast and has to make a sudden maneuver. While commercial trucks may be quite large and heavy—which gives them the illusion of stability and solidarity—they are surprisingly unstable vehicles. A variety of outside forces can cause a truck’s shifting of weight to go the wrong way and possibly lead to a semi-truck jackknife, especially when a driver is going at a high rate of speed. Improper Braking. When a commercial truck driver fails to follow the correct braking procedures or has to brake suddenly because of the failure to have a safe following distance, jackknifing can occur. The driver locks up the drive axles, which causes the truck’s trailer to continue forward and fold into the eponymous jackknife shape that causes horrific damage to cars sharing the road. Steering Errors. When a semi-truck driver makes the mistake of turning too abruptly, they run the risk of their truck trailer jackknifing. Steering errors most often occur during lane changes, on curves, or in reaction to aggressive driving of other vehicles. Improperly Secured Cargo. Cargo shifts in the trailer can cause a jackknife. To reduce the risk, cargo must be properly loaded and secured. Much like with an empty trailer, the sway at the back of a trailer can magnify depending on the maneuvering and weight distribution of its contents. Jackknifing is not the most common cause of a collision, but like most collisions, it is preventable.